Blogger’s note: Feb. 2, 2019, will be the 50th anniversary of Boris Karloff’s death. I’m marking the occasion with a recommendation. Please read on. Unless they build that time machine, I’ll never see Boris Karloff in “The Lark” on Broadway. But thanks to YouTube, I can finally watch Karloff recreate the role for television. 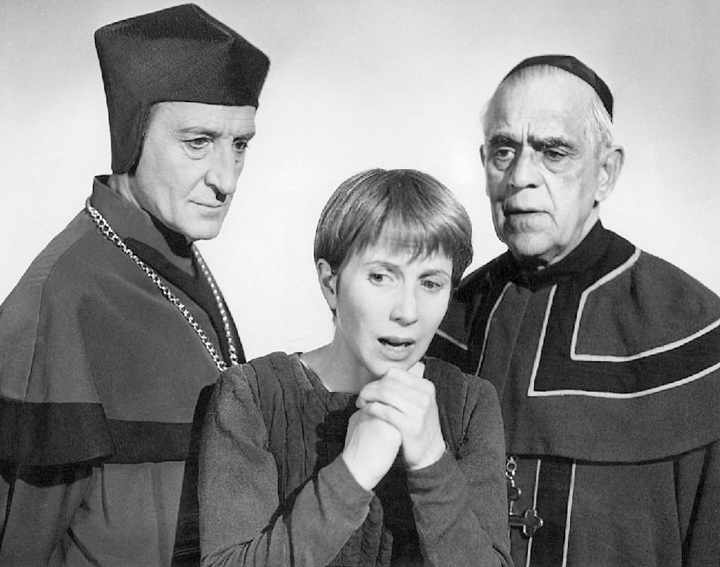 Julie Harris starred as Joan of Arc and Karloff played Bishop Cauchon in “The Lark,” which was adapted into English by Lillian Hellman from the French drama “L’Alouette” by Jean Anouilh. The play ran for 229 performances from Nov. 7, 1955, until June 2, 1956, at the Longacre Theatre on 48th Street (where “The Prom” is now being performed). 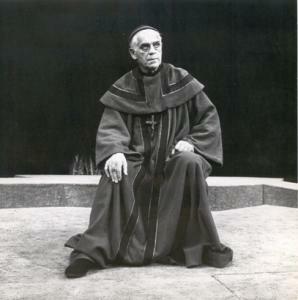 Boris Karloff as Cauchon on Broadway. Harris won a Tony Award, and Karloff was nominated for one — not as a supporting actor, but for the big enchilada, what was then called “Distinguished Dramatic Actor.” For Karloff, it was a crowded field, to say the least: Paul Muni, Ben Gazzara, Michael Redgrave and Edward G. Robinson. Karloff lost to Muni, his fellow player in Howard Hawks‘ “Scarface” (1932). 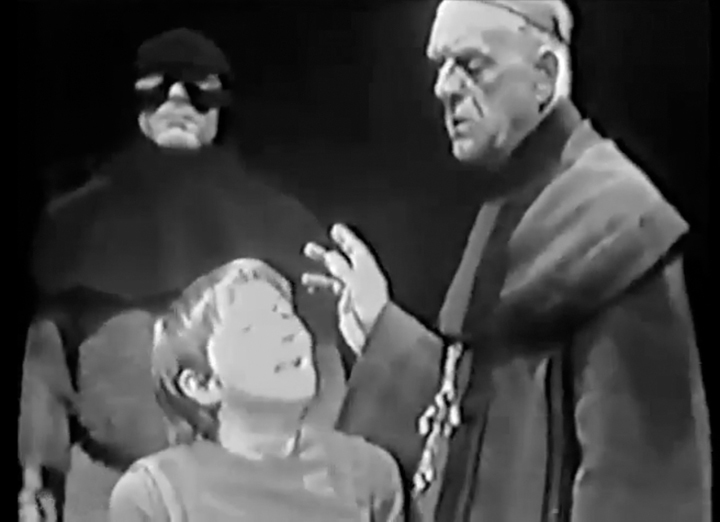 The following year, Karloff and Harris recreated their Broadway roles in a TV production for a Hallmark Hall of Fame special. The TV “Lark,” directed by George Schaefer, aired on Feb. 10, 1957. I’m blown away by Karloff’s performance. I now believe Cauchon is his third-best role, after “Targets” (1968) and “How the Grinch Stole Christmas” (1966). Another happy consequence of the TV “Lark”: Karloff was reunited with Basil Rathbone, with whom he previously played in “Son of Frankenstein” and “Tower of London” (both 1939). Above is a lovely promotional still of Rathbone (as the Inquisitor), Harris and Karloff. 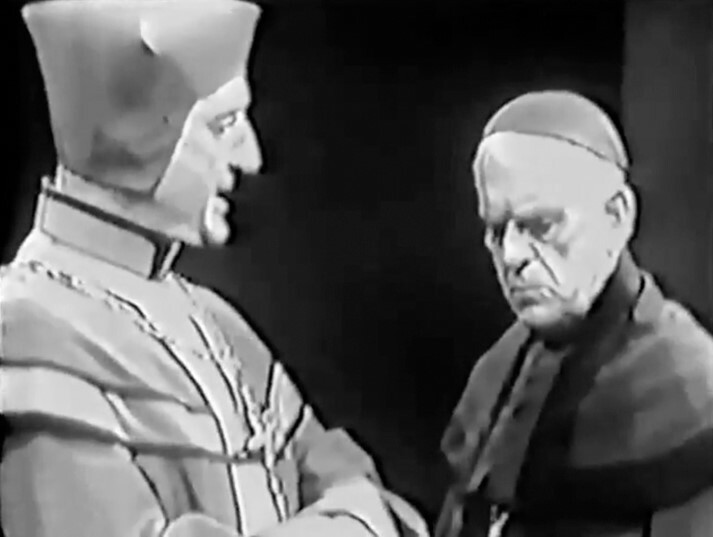 Rathbone as the imperious Inquisitor delivers a veiled threat to Karloff as the distraught Cauchon. It’s fascinating to see Karloff, then 69, and Rathbone, then 64, adapting to this newfangled format, which was kind of a blend of what they’d done all their careers — stage and film acting. The old pros are right on their marks at all times, giving their best. 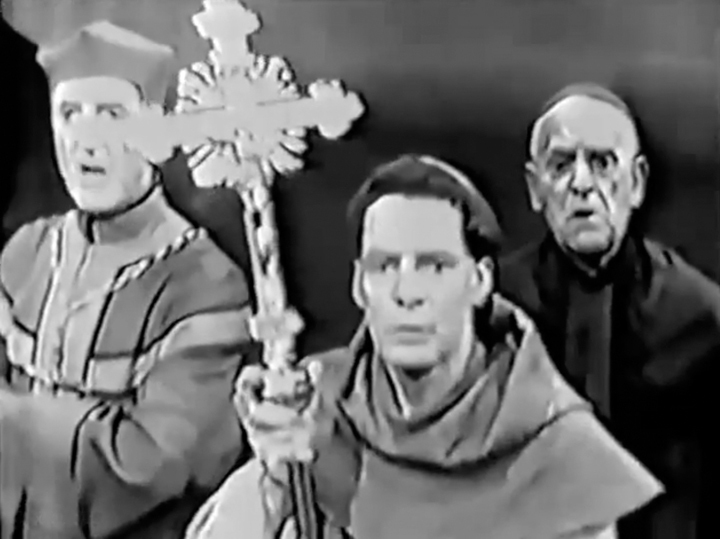 From left: Ralph Roberts as the Executioner with Harris and Karloff. 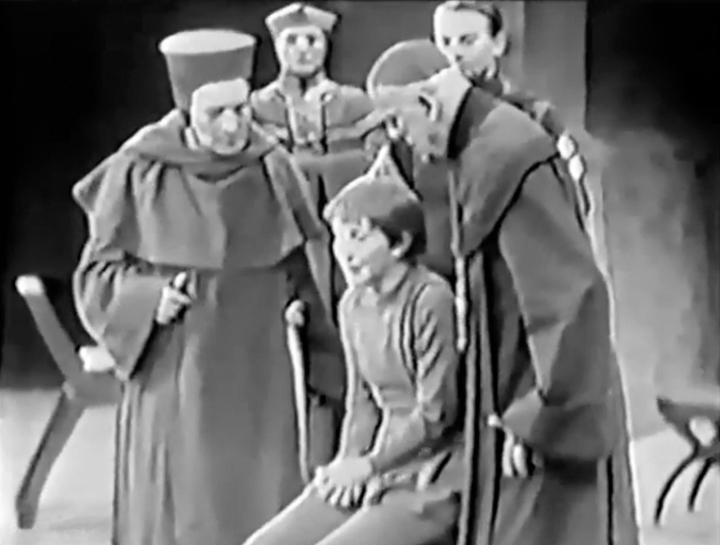 The Inquisitor, Brother Ladvenu (Michael Higgins) and Cauchon watch in horror as Joan is put to death. 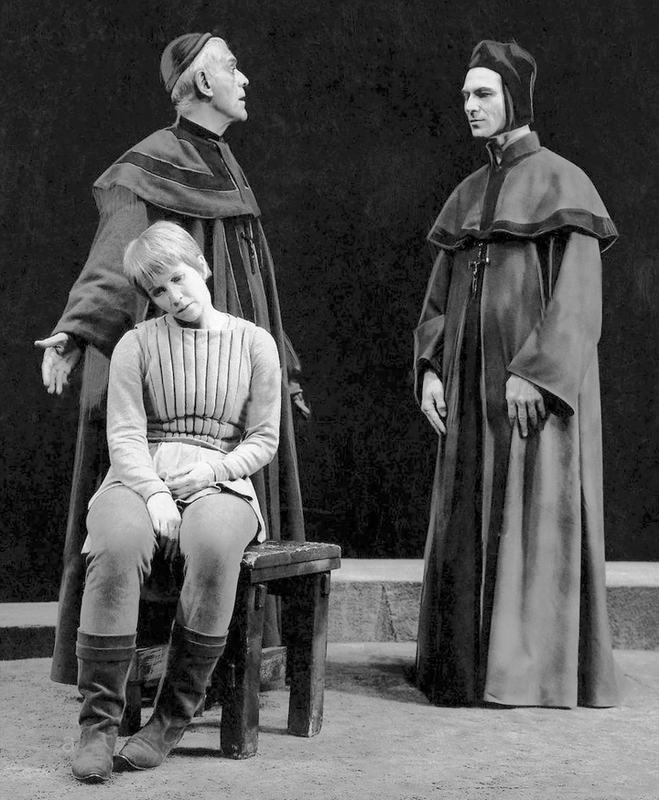 It’s interesting to note that in the Broadway production of “The Lark,” the Inquisitor was played by Joseph Wiseman, shown at left. 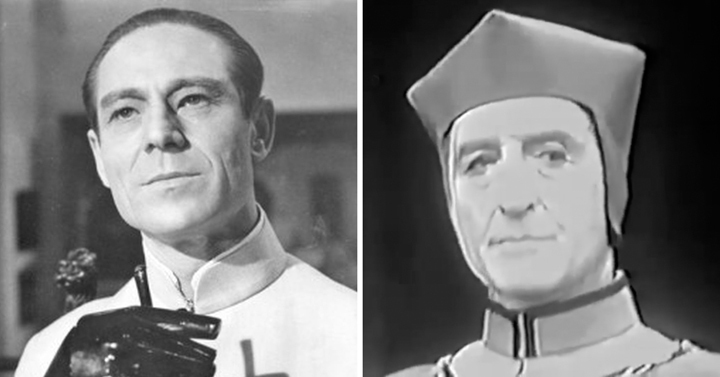 And so, this villainous role was played by two of the screen’s great villains — Dr. No and Sir Guy of Gisbourne! Here is Karloff, Harris and Wiseman in a promotional photo from the Broadway production. Oh, for that time machine! 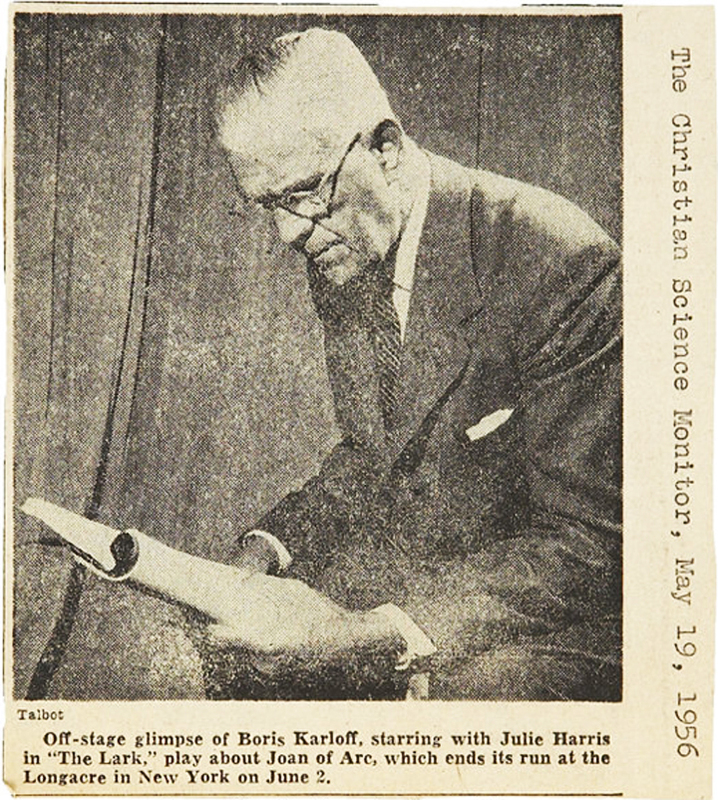 The caption in the above clipping tells us that Karloff was in the Broadway production for its entire run. I’d like to point out here that by 1955-56, Karloff was showing signs of the mobility problems that would plague him for the final decade of his life. (He died at age 81 on Feb. 2, 1969.) It is very likely that Karloff was in pain while playing Cauchon for those 229 performances.